Multiprobe for advanced NSOM, AFM Raman, SPM measurements Up to 4 AFMs in One System Providing up to four AFM systems in one, the MultiView 4000 system is a novel platform for the most advanced experiments in nanoscale transport, optical pump-probe, and read-write lithography. 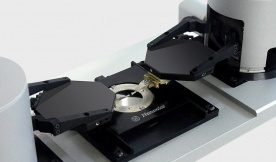 Multiple probe operation enables non-destructive characterization, manipulation, and measurement of electrical, thermal, and optical properties of materials and electronic devices. Operation with up to four probes simultaneously and independently, the MV 4000 is a nanoscale probe station with feedback and scanning capabilities.